If we tried to broaden our horizons and invite new people in, I don’t think we’d have enough servers to be able to handle the influx of new players. I love EverQuest as much as any bit of my gaming history. And all the more so here on the 20th anniversary. But I also try to inject at least some tiny amount of objectivity into my rose colored glasses view of the game. In that spirit, I would have to say that there is no way that EverQuest could attract and hold enough new players that server capacity would be a worry. The idea strikes me as very much an “if I had a magic wand” sort of hypothesis. I’d have to see an example of another game of similar vintage hauling in new customers to be convinced. Remasters of games, like Age of Empires II, and return launches of old games, like last week’s appearance of Diablo on GoG, happen. And the will likely continue to show up. But I don’t see much evidence that this has meant any sort of gold rush of new players these titles. Rather, it seems more a plan to sate demand from an older demographic… people like me who played those games when they were new. There is money to be made on that. Not chart topping, League of Legends money, but enough to support a small team. That said, the article linked… which I also linked in Friday’s post… is well worth a read for fans of the franchise and has a lot to unpack and there are enough tidbits that I could probably write half a dozen posts exploring them. A new expansion, The Burning Lands, was released in December last year, and another is on the way. Those are all out of context, but not dramatically so. Meanwhile, given the fact that every single time EverQuest opens up a progression server there are queues and problems and crashes until things settle down… and that was going on yesterday as Daybreak tried to get the Selo and Mangler servers off the ground… I agree that if they could attract a bunch of new players, there is no guarantee that their current servers could handle it. I just don’t think there is any way they could attract those sorts of numbers. We’ll see if Daybreak has better luck on day two, which also happens to be St. Patrick’s Day as well. Maybe a bit of luck will help them. 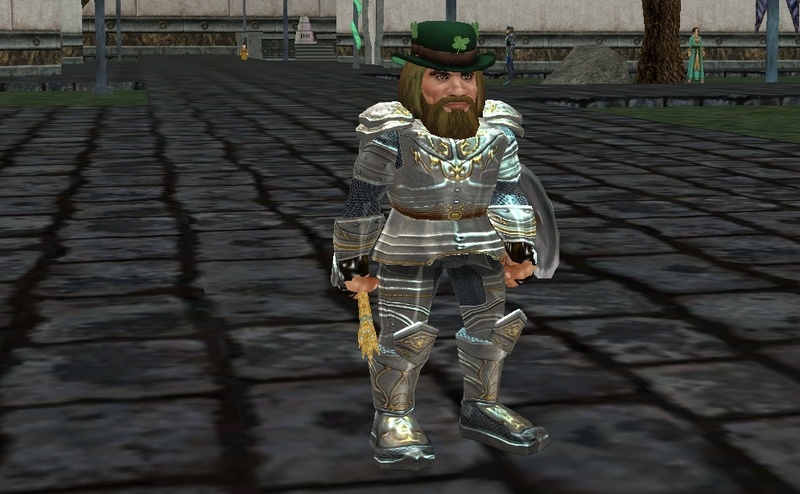 This entry was posted in entertainment, EverQuest, Quote of the Day and tagged Holly Longdale, Progression Server on March 17, 2019 by Wilhelm Arcturus. Playing on Selo’s and Kaladim and listening to the endless stream of general chat on both has been very informative. Even though I’ve played on plenty of Progression servers before I hadn’t realised how the whole thing has grown into a separate culture with its own traditions and expectations. For one thing, it’s very plain that there’s widespread acceptance that these servers are not meant to go on indefinitely, like a Live server would. I’ve been hearing new people ask how long the server will last and the reply is always roughly the same – “until Daybreak launches another one”. That’s not presented as a problem. People seem to be quite happy with the idea that in a year or so the majority of players will have left, either to go back to their Live servers or to other games. Then they’ll all come back and do it again when DBG pops up a new server with a slightly different ruleset. I get the strong feeling DBG are now managing for that quite specifically. If a server does manage to hold a population (Coirnav has, as far as I can tell) then fine, it carries on; if not, roll it into another server and that’s that. The point is to keep opening them on a schedule that gets the large number of organized guilds excited so they keep coming back. Plus all those people they talk to still from the old days, who can be tempted to re-sub for a month or three. I don’t know how long they can keep going on that track. That pool of ex-EQ players is aging and it’s not going to last forever. On the other hand, at EQ’s peak in around 2003-4 I would guess the average age of players was in the mid-20s to 30s so DBG could reasonably expect to spin this out for another decade at least if they manage it well. The fact that they’ve been able to increase the audience over the last four years suggests they are doing that. Frankly, it’s what I’ve been saying for a long time, even though certain media outlets are insistent on denying it: all the MMOs that used belong to SOE have been significantly better-managed since DBG took over. What’s more, I’d contend that the games themselves have improved in quality, at least for a non-raider like myself. I appreciate there’s an element of pay-to-win creeping in at the bleeding edge but I can’t say that bothers me. @Bhagpuss – Indeed! If there is one good thing to say about SOE becoming Daybreak, it is that it seems to have forced the Norrath team to focus on what works rather than the strange flights of fancy they were prone to during the SOE era. For a long stretch, from 2007 through until 2015, the progression server thing was viewed as something of a minor side item. They launched some, but then ignored them. I suppose that as the populations shrank they were viewed as failures for not holding players, as opposed to the success they were given how many players they brought in at launch. As you said elsewhere, making it to the 25th anniversary seems pretty likely, as does hitting the 30 expansion mark, so long as they can keep this routine viable. Where does Everquest II fit into all this? Is it still popular? Do either of you actively play it? @zaphod6502 These days EQII is my second MMO after GW2, although this year it might well have moved up to first. I’ve played it pretty much continuously since 2004 although for the first few years of GW2 I took some lengthy breaks. As a game I feel it’s never been better. I think DBG manage it better than SOE did for most of their tenure. They do as much or more with a fraction of the resources than Smed’s team usually managed, mostly because they don’t go charging off in all directions after weird side-projects that excite them but leave the players cold (SOE Emote, anyone?). The playerbase has settled down a lot in the last 12-18 months. EQII players complain almost all the time about everything and always have but of late some of the complaints seem almost ritualized. Few people seem genuinely angry about the direction of the game. The biggest complaint would most likley be the way Pay to Win has affected the very top end of the game. EQ2 has an excellent cash shop, the best I’ve seen, but one thing it sells are time reductions for spell upgrades. Everything can be done for free in game but it can take months to upgrade a single spell to the best quality and players in top-end guilds doing bleeding edge content don’t feel they can afford to wait so they have to spend money to cut those times. For a regular player like me that is a total non-issue, though. As for how popular EQ2 is compared to EQ, although DBG won’t give figures I would guess EQII is a long way behind. EQ has two dozen servers, of which four or five regularly hit “High” population. EQII has less than half that number and only one or two regularly hit “High”. Of course we don’t know what the caps are on the different servers – maybe EQII’s hardware holds more people. I doubt it, though. You can transfer on/off the TLP servers too. I have three stuck on Ragefire I want to rescue (Ranger, Chanter, Wizard all in their 30s) – I had SO MUCH FUN with the Wizard in the “new” EQ I want to keep playing. Yes, you med for most of it but when you unleash the fury, hell yeah. @Isey – You mean that you cannot transfer on/off TLP servers, right? I don’t know about transferring off really, but the rules are pretty specific that you cannot transfer onto them. @zaphod6502 – I seem to play EQII for about one month out of any given year. I find some task, ride that out, hit the usual lack of direction when that is over, then wander off until the mood strikes me again. It does seem to be popular enough to get an expansion every year still, but as Bhagpuss notes it doesn’t seem to be as popular as EQ. EQ has the advantage of being a game people are nostalgic for, while EQII doesn’t spark nearly as much emotion.